Background: Asthma and COPD are complex, heterogeneous conditions comprising a wide range of phenotypes, some of which are refractory to currently available treatments. Elucidation of these phenotypes and identification of biomarkers with which to recognize them and guide appropriate treatment remain a priority. Objective: This review describes the utility of blood eosinophils as a surrogate biomarker of eosinophilic airway inflammation, a common feature of specific asthma and COPD phenotypes. The role of blood eosinophils in airway disease is described, as is their relevance in reflecting airway eosinophilia. Each disease is discussed separately as the manner in which blood eosinophils might be used as biomarkers differs. 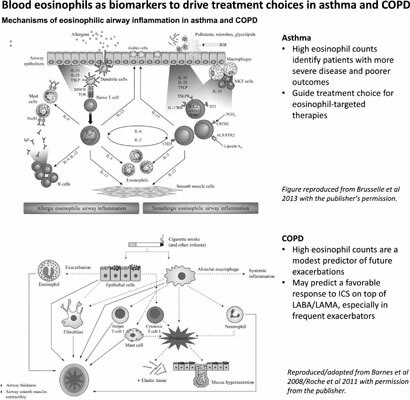 Focusing on patients with severe disease (persistent eosinophilic asthma and exacerbating COPD), we evaluate evidence examining eosinophils as biomarkers. Results: In asthma, the rationale for using blood eosinophils to guide treatment is clearly defined, backed by prospective, well-controlled studies. Higher eosinophil counts identify patients with more severe disease and poorer outcomes, patients for whom biologic therapies targeting allergic and/or eosinophilic pathways are recommended. In COPD, the evidence is less robust. High blood eosinophil counts are a modest predictor of future exacerbations, and may predict a favourable response to ICS on top of LABA/LAMA, especially in patients with a history of frequent exacerbations. Conclusion: Before extensive application in clinical practice, further evaluation of these findings in prospective clinical studies, and standardization of the appropriate thresholds of clinically relevant eosinophilia are needed, together with establishing whether single or multiple measurements are required in different clinical settings. Blood eosinophils, asthma, COPD, biomarkers, airway inflammation, treatment options.